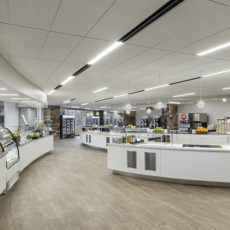 Hartford Steam Boiler’s Cafeteria Renovation project provides an engaging, innovative and inviting space for building tenants and the surrounding community. OFI provided furniture for a modern café that accommodates over 200 people with power, voice & data. High top tables with integrated power and nearby flat screen monitors can accommodate individual or group meetings. OFI supported architectural firm id3A and Hartford Steam Boiler’s vision in sourcing products and finishes for a bright, upscale environment. The kitchen was relocated to the interior space, allowing for more natural light in the seating area. The long-standing relationship between OFI, id3A and Hartford Steam Boiler resulted in a harmonious collaboration from the design through installation. This project received a 2017 CBC Small Project award of merit.